This retreat will offer you the chance to truly unwind and nourish your soul with yoga, meditation, breathing practices, thai massage workshops & yoga nidra. You will be treated to delicious vegetarian food, have the opportunity to relax by the pool, sleep in gorgeous rooms with spectacular views, be indulged with beautiful massage treatments, take rejuvenating walks around the stunning countryside and enjoy great company with like-minded people. Food is vegetarian and locally sourced with meals served at the banquet dining table outside the main house. Typical meals may include fresh bread, tasty soups, pizza, home made cakes, home made peach ice-cream with apple crumble, curry, risotto….. always plenty of variety in fresh homemade locally sourced food. Lots of walks or visits to local attractions/ towns like Granada are available in your free time to, plus theres a sauna, a swimming pool and amazing massage booked to compliment your yoga experience. We do an optional evening meditation after dinner and two yoga sessions in the day. From yoga to shopping, walking to massage there is plenty to do and see and yet you will leave feeling rejuvenated and relaxed. Price includes all yoga, meals, accomodation. All food, yoga and accommodation (sharing). Extras/not included: flights and any activities, massage, trips/excursions you wish to do. 1. It is the customer’s responsibility to check the terms and conditions. Payment of the deposit is seen as acceptance of the terms and conditions. 2. The customer shall pay Yoga in Cheshire a non-refundable, non-transferable deposit for each person named in the reservation. 4. If payment of either the deposit or the balance is not received by the due date Yoga in Cheshire reserves the right to cancel the reservation and retain the deposit. 6. Due to teacher cancellations or other situations beyond our control, Yoga in Cheshire reserves the right to change bookings and shall inform the customer as soon as possible. Alternative arrangements will be offered but we do not accept responsibility for any costs incurred, including airfare. 7. Yoga in Cheshire is not held liable for flight costs. 8. Yoga in Cheshire reserves the right to offer discretionary discounts and this does not affect the status of any guests who have paid the full price and no discount will then become due to them. 9. The customer shall not use the property except for permitted use and shall not use the property for any offensive, noisy, dangerous, illegal, entertainment, immoral or improper purposes. The customer shall not do anything which may be a nuisance or annoyance to Yoga in Cheshire and its guests, staff or owners. 10. The customer shall keep all at fixtures, fittings, furniture and effects in a clean and good condition and shall replace any articles which are destroyed or missing with articles of a similar kind and of equal value. 11. Yoga in Cheshire reserves the right at its sole discretion to terminate use of the property or any of its facilities by the customer in the event of any breach of these terms and conditions. The customer will be required to vacate the property and Yoga in Cheshire shall not refund payment or accept any consequential liability damages or loss. 12. Yoga in Cheshire can accept no responsibility for delay or cancellation of any flights, train, buses or other forms of transport. 13. The customer must comply fully with all and any health and safety regulations introduced by Yoga in Cheshire. The customer must ensure that he/she is medically and physically fit and able to use our facilities and participate in activities. Customers who have injuries or illnesses are advised to seek doctor’s advice if practicing yoga. Yoga in Cheshire is not liable for any injuries to the customer in his/her use of our facilities or participation in activities. A customer must always stop and rest if he/she is feeling any pain or sickness and inform the teacher of any previous injuries. 14. Yogs in Cheshire cannot accept any responsibility for loss or damage of personal possessions or valuables of the customer. 15. Yoga in Cheshire shall not be liable for any failures beyond its control. This covers natural disasters, war, ‘acts of God’, closure of airports, civil strife, accidents or failure to perform by third parties, including suppliers and subcontractors. 16. 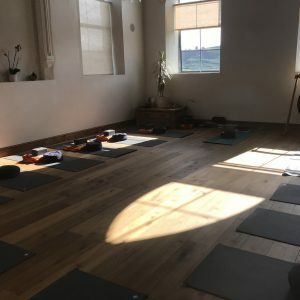 Yoga in Cheshire accepts no liability for loss, damage, injury or illnesses which may be received during the customers stay or travelling to and from Lotus Yoga Retreat. 18. It is your responsibility to notify Tabitha of food allergies/ intolerances more than 4 weeks prior to the retreat. The Hacienda retreat centre is a beautifully converted farmhouse set in 5 acres of private woodland and olive groves. It is a remote peaceful setting including three yoga spaces; two outside and one beautifully designed indoor space for evening meditation or cooler days.The bedrooms are very individual, including ensuite, balconies and terrace views of the mountains and umbrella pine forest. Accomodation is in beautifully individual single, twin or double rooms with en-suite bathrooms. Price is £595 based on 2 sharing or £85 single supplement (shared bathroom) for 4 nights. Ensuite single rooms are available (please contact for details as supply is limited). Price includes all yoga, meals, accomodation. This retreat will offer you the chance to truly unwind and nourish your soul with yoga, meditation, breathing practices, thai massage workshops & yoga nidra. It’s a relaxed experience designed to make you feel comfortable and nourished in body and soul. All activities are optional so you can do as much or as little as you choose. You will be treated to delicious vegetarian food, have the opportunity to relax by the pool, sleep in gorgeous rooms with spectacular views, be indulged with beautiful massage treatments, take rejuvenating walks around the stunning countryside or visit beautiful Spanish towns and enjoy great company with like-minded people. Lots of walks or visits to local attractions/ towns like Granada are available in your free time too plus theres a sauna, a swimming pool and amazing massage booked to compliment your yoga experience. You can also pre book bicycles to explore the local countryside. Tasty three course meals cooked by the venue. Food is vegetarian and locally sourced with meals served at the banquet dining table outside the main house. Typical meals may include fresh bread, tasty soups, pizza, home made cakes, home made peach ice-cream with apple crumble, curry, risotto….. always plenty of variety in fresh homemade locally sourced food.